While many around the world choose not to believe in a god or gods, there are plenty who do. Here are the 10 most popular world religions and belief systems according to FindTheBest.com. Most of the religious Western World (North America, Europe, and Oceania) follows this monotheistic religion based on the Bible. 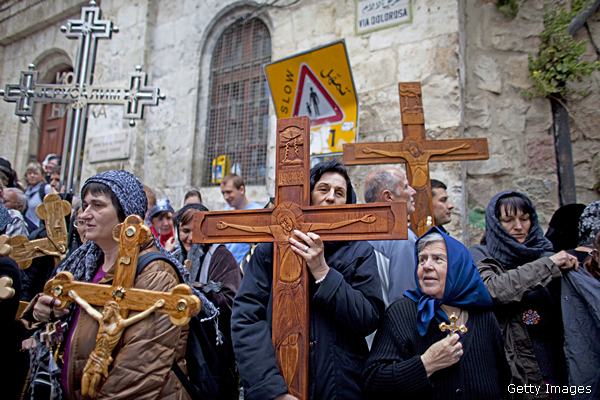 Above, Christian pilgrims carry wooden crosses along the Via Dolorosa during the Good Friday procession on April 22, 2011, in Jerusalem, Israel. Thousands of Christians around the world on that day marked Good Friday, which is when Christians commemorate the crucifixion of Jesus Christ. In Jerusalem, Christian pilgrims took part in processions along the route that Jesus is believed to have taken in his last days as he carried the cross. Islamic pilgrims perform the walk around the Kaaba (Tawaf) at the Grand Mosque in the Saudi Arabian holy city of Mecca on Nov. 9, 2010. The Kaaba, Islam’s most sacred sanctuary and pilgrimage shrine, which stands in the heart of Mecca’s Masjid Al-Haram mosque, contains the holy Black Stone believed to be the only piece remaining from an altar built by Abraham. 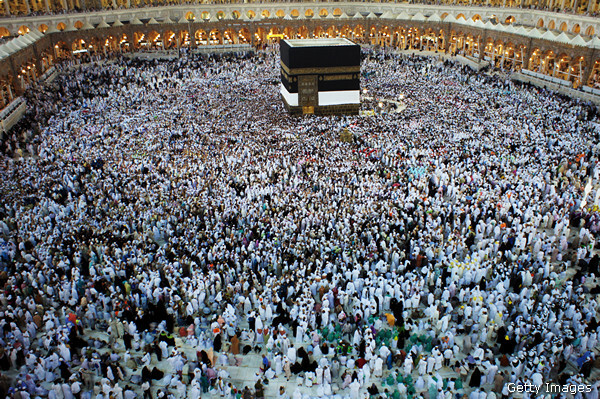 Pilgrims try to touch and kiss the Black Stone and the door of the Kaaba. “Islam” literally means “submission to God” and the Quran is its holy book. Islam is most often practiced in the Middle East, Northern Africa, Central Asia, South Asia, Western Africa, the Indian subcontinent, Malay Archipelago with concentrations of worshipers in Eastern Africa, the Balkan Peninsula, Russia, and China. For some, Catholicism refers to Christians and churches belonging to the Catholic Church in communion with the Holy See, for others it refers to continuity “back to the earliest churches,” which is claimed by other churches in mutual disputes over Christian doctrine and practice, such as the Eastern Orthodox Church, Oriental Orthodoxy, the Assyrian Church of the East, the Old Catholic Church, and the Anglican Communion. 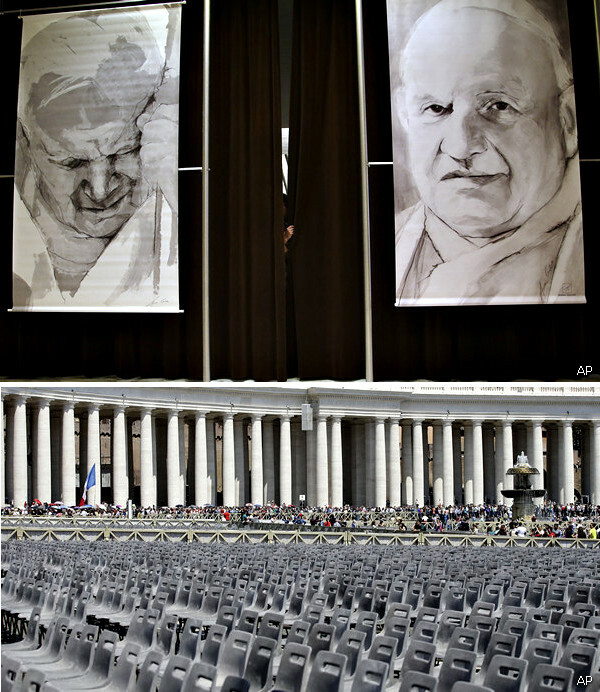 Top: A press hall attendant holds the curtains adorned with portraits of late Pope John Paul II, left, and John XXIII prior to the start of a news conference at the Vatican on Friday, April 25, 2014. Bottom: The Faithful walk next to rows of empty chairs in St. Peter’s Square at the Vatican on April 25. Hundreds of thousands of pilgrims and faithful were expected to attend the April 27 ceremony at the Vatican in which Pope Francis elevated in a solemn ceremony John XXIII and John Paul II to sainthood. Top: Hindus and Sadhus celebrate Diwali (the start of the Hindu New Year) at the BAPS Shri Swaminarayan Mandir, the first traditional Hindu temple to open in Europe, on Nov. 14, 2012, in London. Middle: Indian Hindu devotees pray before forming a human pyramid to break a dahi-handi, curd-pot, suspended in the air during celebrations of Janmashtami, which marks the birth of Hindu God Lord Krishna in Mumbai on Aug. 10, 2012. Hindu men and boys receive prize money by constructing a human pyramid until it is tall enough to enable the topmost person to reach the pot and claim the contents after breaking it. Bottom: Hindu devotees bathe in the holy Ganges river during the royal bathing day of Makar Sankranti, the start of the Maha Kumbh Mela on Jan. 14, 2013, in Allahabad, India. The Maha Kumbh Mela, perhaps the largest religious gathering on earth (attracting more than 100 million people) is held every 12 years on the banks of Sangam, the confluence of the holy rivers Ganga, Yamuna, and the mythical Saraswati.